By now, most yacht clubs have wrapped up their racing and cruising programs for the year, giving sailors a break for the holidays. During this time a number of boats will begin to catch up on routine maintenance for the approaching season. Sail care is essential to a boat’s safety and proper performance. Ullman Sails has your checklist of what to inspect and review to ensure your sails are ready for the next adventure the wind may take you. Reminder: Remove your sails from your rig, when inspecting, if they have not been taken off already. You will need to be able to handle every part of the sail and examine closely for fine details. Inspect every slide or slug for wear. Look for cracking or corrosion on the bails or thinning of the base material. The top slide which does the most traveling will show the most wear. Check the webbing that attaches your slides to the grommets along the luff of your mainsail; make sure that all sewing is secure and tight. Check all grommets for corrosion or cracking. 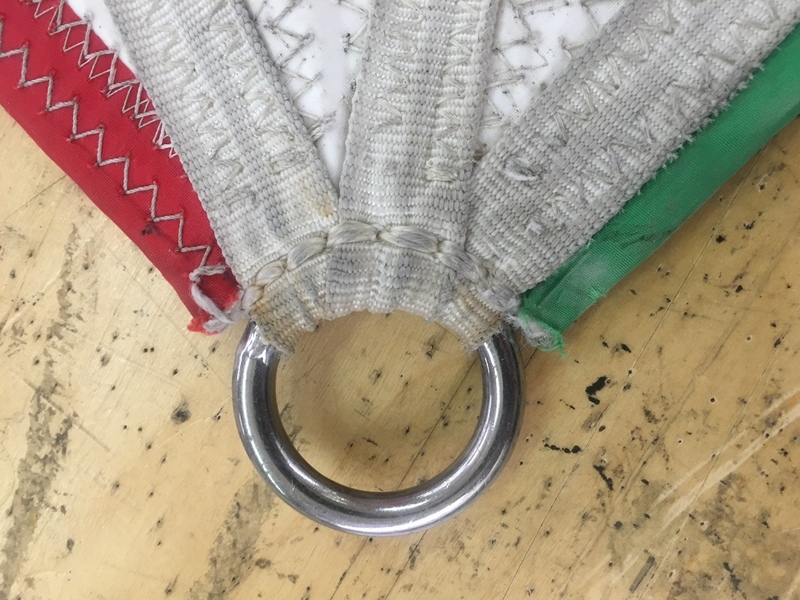 On mainsails, give the bolt rope a thorough inspection- check the hand-sewing at the head, reef(s), and Cunningham to ensure they are locked tight. With headsails, check the top and bottom of the bolt rope inside the luff tape for wear and tear. Make sure no parts of the bolt rope are severed or exposed along the luff of your sails. Check your corner rings and/or reef rings for rust, cracking, bending, or other deformation- your rings should be perfectly round as you received them when new. Make sure that any hand-sewing around the rings or webbing and adjacent to them in the corners are locked tightly and are continuous. 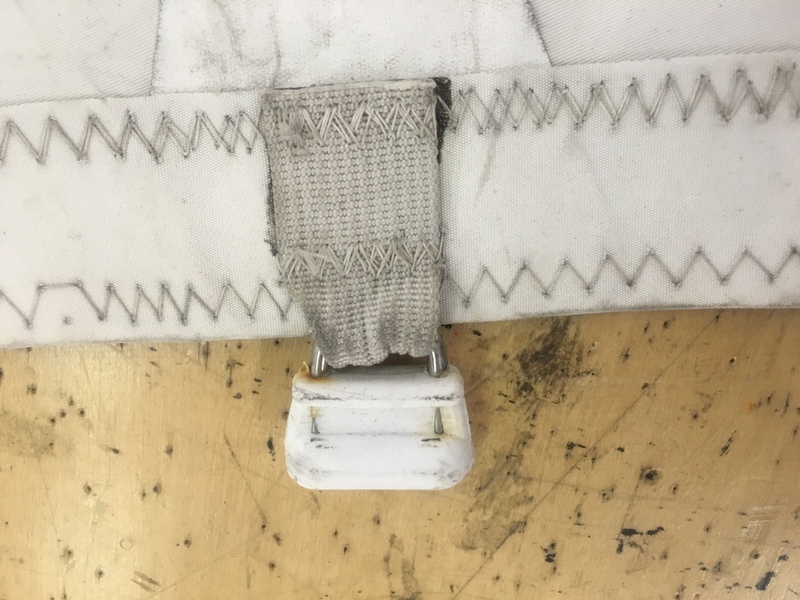 Inspect the stitching in the reinforcement layers of sailcloth in your sail’s corners and/or reefing points. Make sure both sides of all stitches are continuous with no breaks. Carefully examine your mainsail’s headboard. Make sure there is no rust or corrosion in the board, the rivets, and any rings or liners. Make sure you check your mainsail’s reef diamonds or ‘cringles,’ for stitching integrity and for any corrosion or cracking in the grommets. De-tension your battens if they are under any load or open up any Velcro in the pocket and allow them to decompress. Be sure to count the number of turns you take off of any tensioners and write them down. Check the stitching all around the batten pockets for continuity. Inspect any Velcro, webbing, lashing, or strapping involved with keeping your battens secure within the pockets for wear; make sure that nothing can fail, resulting in the loss of a batten, while sailing. Carefully examine any parts of the pocket that may rest against shrouds, spreaders, and other rigging for abrasion or general wear. Examine any tell tails along the leech of mains and jibs. Check the end of the tell-tail for fraying and trim the end if needed to create a clean edge. Replace your tell tails if they are too short. These are key to proper sail trim. Spread out your sails and check for any holes in the sailcloth. Check carefully around the corners and along the leech; these are your high-load and wear points of the sail. Check stitching along all seams for continuity. Double check both sides of the leech as these can be exposed to UV while your sail is on the boom while uncovered. 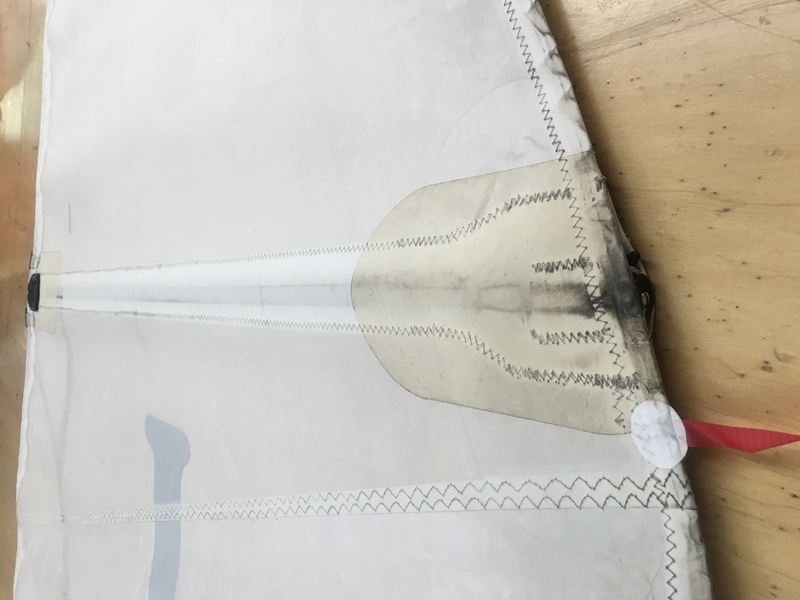 If your headsail has a UV cover sewn onto it, check the canvas cafefully for any holes that may allow sunlight to damage your sail. Make sure all stitching is continuous with no breaks. Laminate sails will have some seams bonded- check carefully for continuity and make sure there is no unbonding anywhere. Inspect all tell tails along the luff of your headsail for fraying. Replace any tell tails with frayed ends. Check any tell tail or vision windows for cracking and make sure the edges are firmly sewn or bonded to the sail. De-tension and inspect your leech and foot cord for wear and UV exposure. The sail edges should never flap or vibrate when the wind comes up. Check all cleats or tension systems for your leech and foot cord for corrosion and/or stitching integrity. Inspect along all foot and leech tapes, especially spinnakers where this can be quite common, for tears that might expose your cords to UV. Inspect your sailbag for any tears in the fabric; make sure all seams are sewn tightly. Check any zippers and zipper tracks carefully for any damage. Check any webbing or strapping sewn onto your sail bag; make sure they are tightly secured to the bag. Examine any clips that may be used to secure your sailbag to a lifeline or other part of the boat. Make sure they are free of any corrosion or fouling that may prevent proper function. Lubricate well before storing. 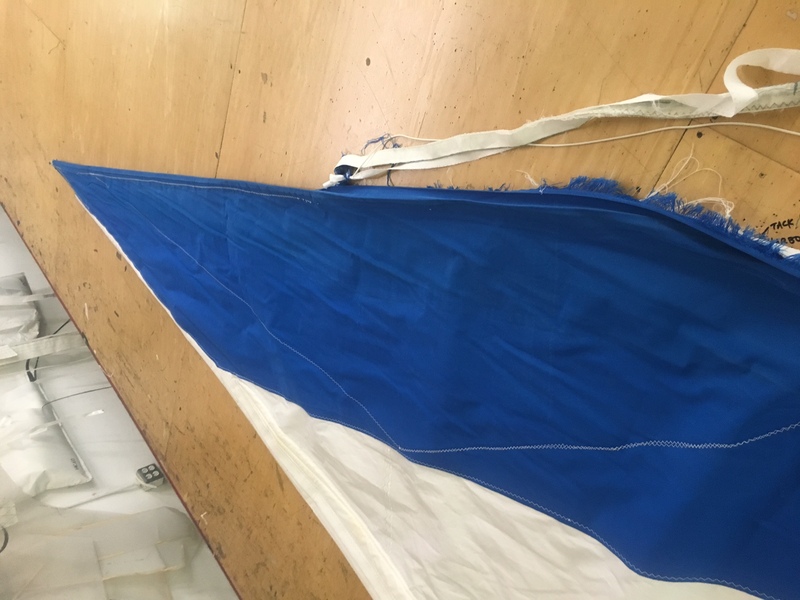 For best sail care and maintenance, take your sails in to your sailmaker and have anything that requires attention repaired or serviced for the next season. Your sails will seldom fail in the safety of the harbor or in calm winds- have them prepared for the worst that nature can throw at you! When storing your sails until the next season off of your rig it is best to roll your main(s) and headsail(s). Store them, bagged, in a dry location where they will be free of any UV exposure. Store battens outside of your mainsail and any jib(s) that require them; be sure to write down which batten set goes to which sail to avoid future confusion. Headsails that may be too large to roll should be neatly folded and rolled up for storage. Be sure to avoid folding laminate sails along the same fold lines to prevent fracturing the fibers inside of the mylar. Spinnakers should be properly packed inside of their bags with corners organized and on top (this will help make your spinnakers bowman resistant- nothing is bowman proof). Make sure that your spinnakers are thoroughly dry before storing to avoid growing a mold or mildew farm inside of your sail. 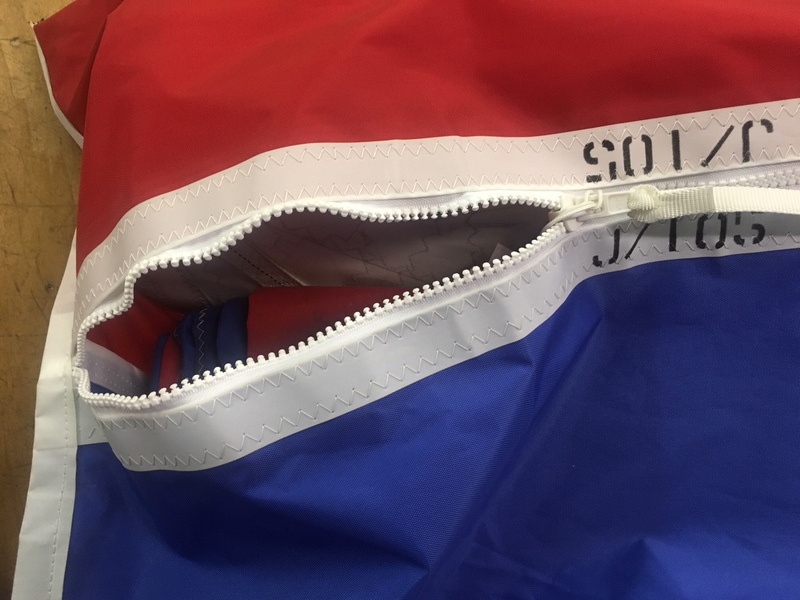 If storing your sails on your rig, make sure that your boom-cover or U-Stack is fully enclosed so no part of your mainsail is exposed to any sunlight or UV. If your boat has lazy jacks or a Dutchman system, consider running the lines along the boom and under the cover so they exit the collar near the head at the mast to avoid any moisture or dirt creeping down and into your sail while it is not being used. Headsails being stored on a roller furler must be rolled tightly and it never hurts to put a few extra turns on with the jib sheets to help keep everything safe and tight. Make sure you have good coverage with your UV cover and that there are no stripes of sailcloth showing in between the rolls of canvas. Before leaving your boat with sails on the rig for any periods without use- ask yourself: Will my sails survive the next 40+ knot wind storm? If you have any questions or need help servicing your sails, call your local Ullman Sailmaker. We are happy to talk with you and provide guidance about anything your sails or boat may need to be safe and ready for the next season of sailing. For more information call (714) 432 – 1860.